Since 1974 Americans have been able to invest tax-deferred and tax-free retirement funds in real property. According to the Investment Company Institute, there are approximately $3.7 trillion invested in IRA’s. Mutual funds contain about 98% of the retirement industry. 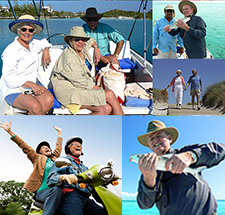 A recent national publication suggests that American’s should have at least 25% of their retirement invested in real estate. Today, it is estimated that only 2% the $3.7 trillion is invested in real estate. So how do you make that first real estate purchase with your IRA? The taxpayer establishes a new account at a Self-directed IRA Custodian. 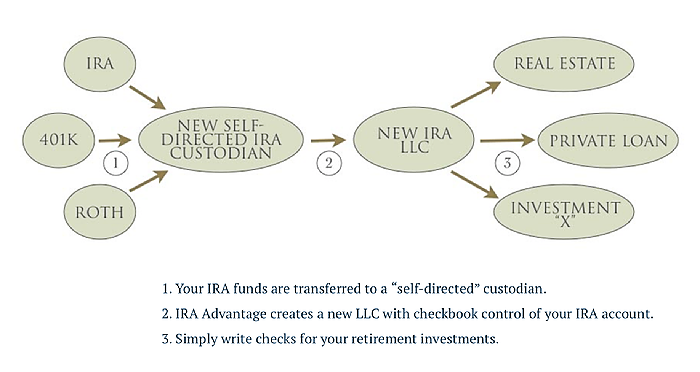 The taxpayer funds the new Self-directed IRA account. The taxpayer directs the custodian to have the IRA acquire the real estate. Use an IRA LLC (Derived from legal tax case in 1996: Swanson v. Commissioner. The Checkbook LLC allows investors to acquire investments simply by writing a check while using a self-directed custodian saves money to set up. Call IRA Advantage today to review your opportunities and the best path to your next investment! 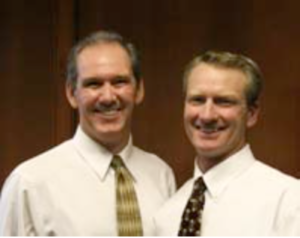 Can’t make our monthly Equity Advantage and IRA Advantage Continuing Education Seminars? Now catch some of the highlights available online from the comfort of your cell phone or computer! Head to our channels and watch as owner of Equity Advantage and IRA Advantage, David Moore speaks on the basics of 1031 Exchanges and Self-Directed IRA’s in today’s market, including What Is An Exchange, What Can Be Exchanged, How Are Self-Directed IRA’s created, and more! 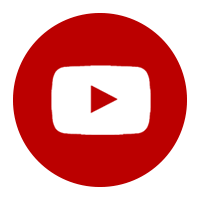 Subscribe to our channel for more videos! 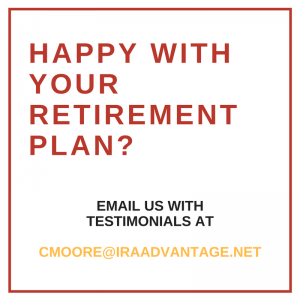 Call today to speak to the experts at IRA Advantage. 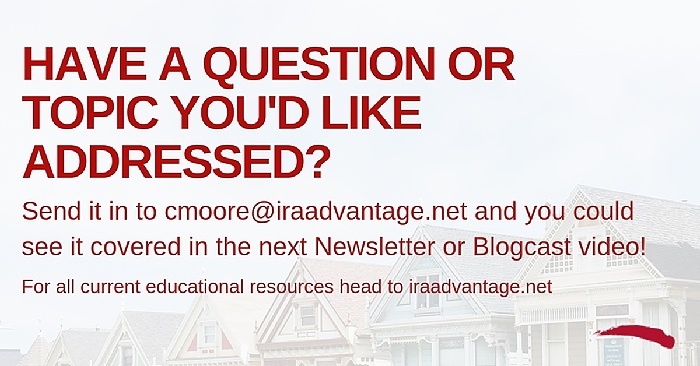 IRA Advantage News Letter: IRA Investments - What Are Your Options? 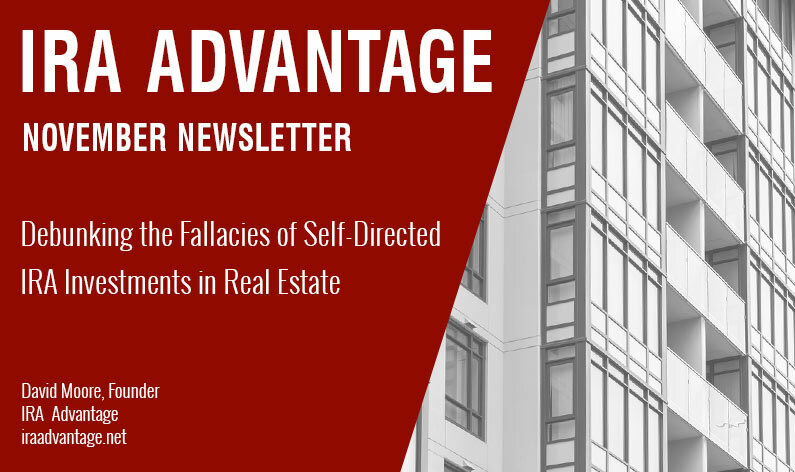 IRA Advantage Newsletter: What is a Self-Directed IRA?